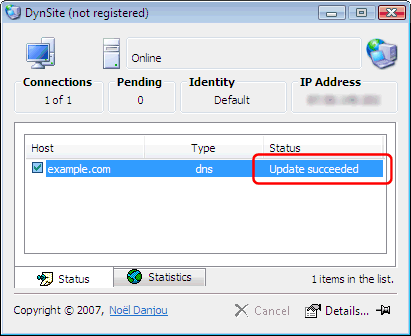 You can use DynSite to automatically update DNS records on a remote Simple DNS Plus server. 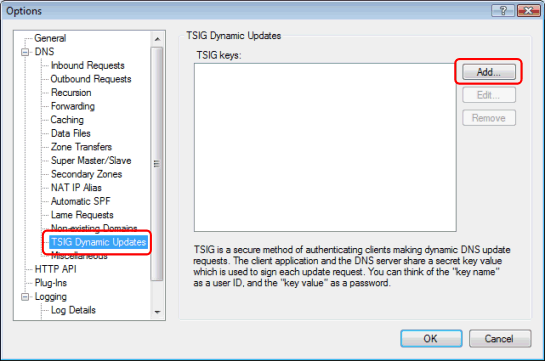 DynSite will update the DNS records each time the IP address changes on the local computer. In the following example, we have a roaming laptop with a dynamic IP address (currently 5.6.7.8) which we want to access using the domain name "laptop.example.com", and we are running a Simple DNS Plus server with the name of "ns1.example.com" on IP address 11.22.33.44 (static). Step 1: First you need to setup a "example.com" zone that will hold the DNS record for the laptop (the dynamic IP computer). See this article. If you have already setup a zone for your domain name, you can use that. 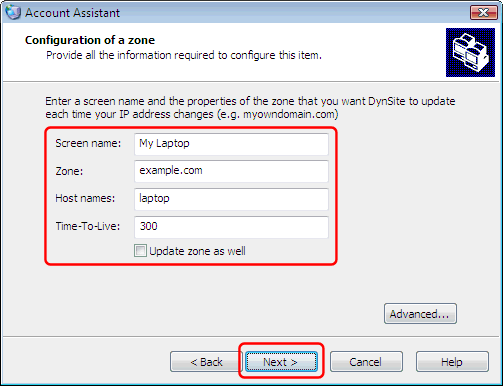 Step 3: Setup DynSite on the laptop. 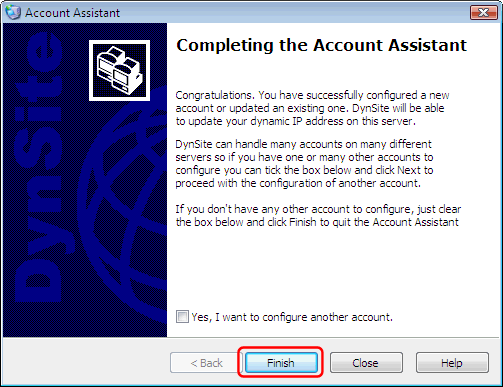 After installing DynSite, you need to add a new account for the Simple DNS Plus server to it. 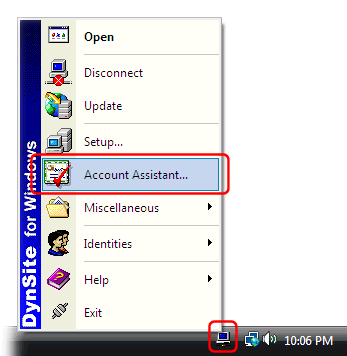 The first time you run DynSite, the startup wizard eventually takes you to the "Account Assistant". In the "DNS server" field, enter the domain name or IP address of your Simple DNS Plus server. In the "Server Port" field, enter "53"
In the "Method" field, select "Transaction Signature (hmac-md5)"
In the "Key name" field, copy the key name used in Simple DNS Plus. 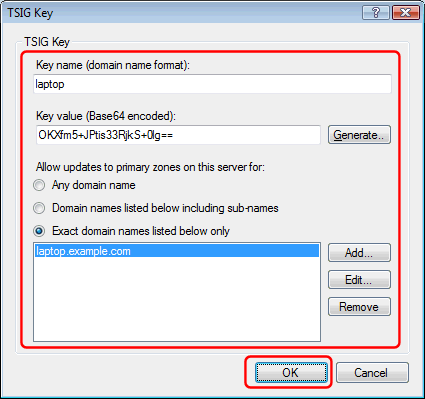 In the "Key value" field, copy the key value used in Simple DNS Plus. In the "Screen name" field, enter the full domain name of the client computer. In the "Zone" field, enter the name of the zone where you want the DNS record in Simple DNS Plus. 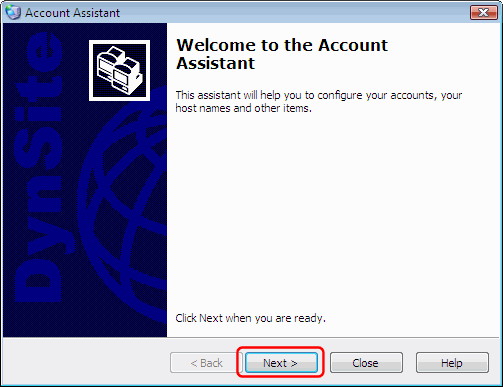 In the "Host names" field, enter the first segment of the client computer domain name. In the "Time-To-Live" field, enter the number of seconds that this record may be cached by other DNS servers. Whenever your IP address changes, this value determines how long it takes before all of the Internet once again can reach you through the domain names. We recommend using 300 (5 minutes) or less.